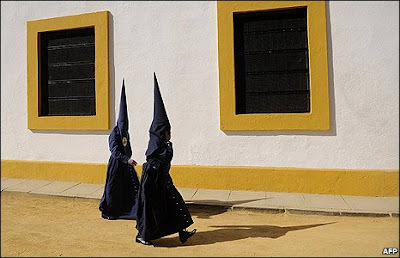 Two penitents walk through Seville in Spain, as part of events marking the Holy Week leading up to Easter. 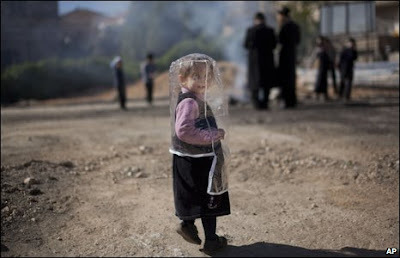 An Ultra-Orthodox Jewish girl wears a plastic cover to protect her from smoke ahead of the Passover holiday in Jerusalem. 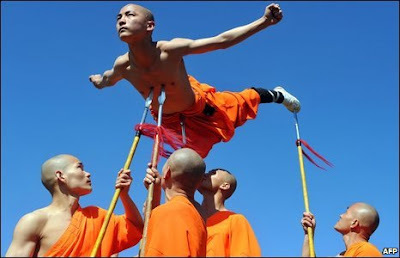 Shaolin Wu-Shu Warriors show their expertise as the Chinese State Circus arrives in London. Fascinating photos! Wow! Have to admit the last one made my ribs flinch! How neat they all are though and thanks for sharing them! These are interesting images of people, people who test their limits, and people whose work makes others smile. Those are truly interesting and unusual shots Mary. I thought the eggs were snooker balls at first! Oh my ! it looks like the Klu Klux Klan in black ! 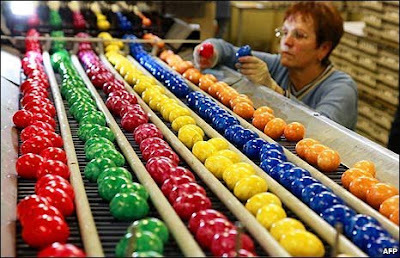 We always have dyed eggs my family I mean whole Germany and to make them shiny you rub bacon over them. In Belgium we do it too. That first photo looks quite evil. Definitely Klu Klux Klan looking! Odd indeed but also interesting glimpses into other cultures! I'm not sure if the first shot or the last one made me uneasier. Those penitent guys don't look at all penitent to me! In fact, they look pretty creepy. And don't the Hassidim read those "Keep Away From Children" tags? That looks more than a little dangerous if you ask me. Surely there's got to be a better way. I mean what were they using before there was plastic?? Use that! It's got to be less hazardous!